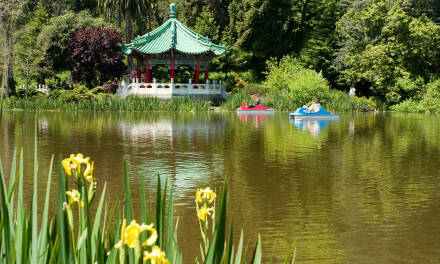 Despite its smaller size, Metson Lake has gained a reputation for being one of the prettiest lakes in Golden Gate Park. Less frequented than other bodies of water, the relatively overlooked location of the Metson Lake means you can steal away a few moments of peace and serenity without encountering the hustle and bustle of crowds typical of the larger lakes. Constructed in 1908, a short walk around the lake provides a relaxing excursion surrounded by the beauty of foliage, including wild blackberry bushes. Bring a book or magazine to read during your visit – there are benches found on the south side of the lake. Sometimes, it’s just you and a gaggle of ducks, geese, seagulls, turtles, and if you’re lucky – a heron. Photo seekers will find an artificial waterfall at the east end of the lake. Walk up the hill behind the waterfall to discover a pleasant grassy space – an ideal place to lay out a blanket and enjoy a romantic picnic. Enjoy the view while you’re there, and take the time to clear your mind and embrace the beauty of the park. In the past, Metson Lake has hosted events, such as the All-Skate Jam, where skateboard enthusiasts gathered to party, eat, drink, and be merry as freestyle teams entertained and participants aimed at breaking Guinness World Book records. Metson Lake is located just southeast of Speedway Meadow and Polo Field on Middle Drive West – east of Martin Luther King Jr. Drive. To reach the front of Metson Lake, it’s best to use the entrance on Lincoln Way on 25th or 41st Avenues.